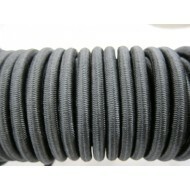 Bungee cords, also known as shock cords, are elastic cords comprised of one or more elastic strands forming a core which is then covered in a woven material such as polypropylene, polyethylene or cotton. 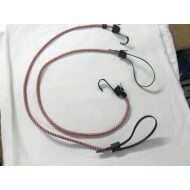 Bungee cords are used for a variety of purposes and are commonly used to secure objects without the need to tie a knot. They can be used to apply tension to nets or banners and secure them to a frame or other structure. 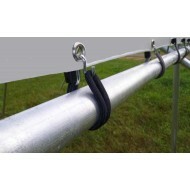 Plastic or metal hooks or fittings can be added onto the bungee to modify them for different uses. Nets, such as our range of elasticated bungee cargo nets, can be used to cover irregularly shaped luggage and cargo for example in the boot of a car or on a pick-up truck. 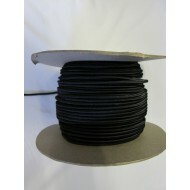 We stock a wide range of Bungee and Shock cords in a variety of diameters and colours. They are suitable for indoor or outdoor use and are available with fire retardant properties. 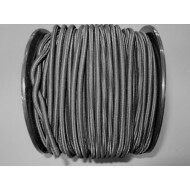 The diameter of the bungee cord ranges from 3mm to 12mm and are available in various lengths with or without specialised fittings. Bungee cords are used for a variety of purposes and are commonly used to secure objects without the ..
Combi-wrap: releasable bungee or cord tightener. 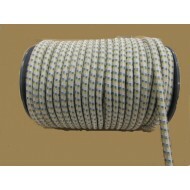 The Combi-wrap consists of a bungee with an adap.. 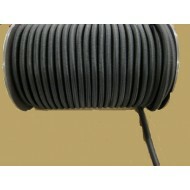 These hooks are provided with a double coating on the 4.5 mm steel wire: zinc plated, followed by ..